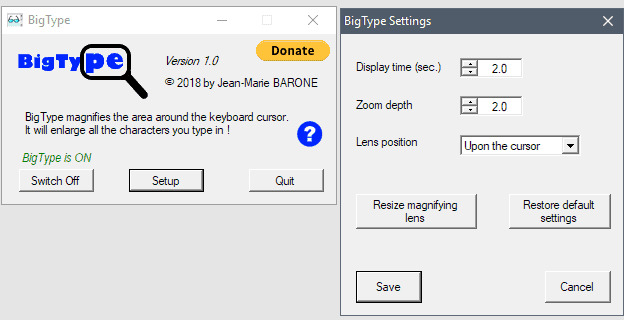 BigType is a free portable accessibility software for Microsoft Windows devices that magnifies text you write automatically using a magnifier window. Visually impaired computer users have a couple of tools and options at their disposal to improve the display of text on the devices they use. They may be able to change the font size globally or in specific programs, or use helper applications like magnifiers to improve readability. BigType is one of those helper applications. The program requires the Microsoft .NET Framework and will run on any version of Windows that support that version of the framework. Just download the application to your device, extract the archive that it is supplied as, and run the bigtype executable to start it. BigType displays its main interface on start which you use to toggle the functionality and configure some program settings. Change the display time of the magnified text you wrote on the screen. Change the zoom depth of the magnified text. Switch to another position of the magnifier on the screen. Setup includes an option to change the size of the box the magnified text is displayed in and to restore all settings to the default value. A click on save completes the process; the new parameters are immediately active. You should notice that a box with magnified text is displayed to you when you type when BigType is enabled. This may take a minute or two of getting accustomed to but that should not be too long. You may want to play around with the different box positions to find the one that is best suitable for you. I ran a quick test in several programs and BigType worked fine in many but not all of them. It did work properly in Notepad, the Windows Start Menu or Microsoft Word, but had a display issue in Firefox, Chrome, Thunderbird or Microsoft Edge. The box with the magnified text was displayed in the top left corner instead of near the cursor in browsers and I could not find a way to resolve the issue. How useful BigType is depends therefore on the programs that you use. I suggest you give it a try and test this for yourself. We will adjust the rating of the application when the issues are resolved. Now You: Do you use accessibility tools? The magnifying glass available in Windows 10 can do it and more, there are plenty of other options. Off topic Martin, but the comments wont load for me if I don’t enable java script. This didn’t happen before, has anything changed? I’m testing lazy loading currently to speed up things. I am testing the Avast Secure Browser from https://www.avast.com/secure-browser Version 64.0.388.186 (Official Build) (32-bit) and the latest Windows 10 Fall update has the Magnifier function which is far more useful to me with any browser or application I have tried. I’ve set my display scaling and default font sizes to where I can decipher *most* text and graphics in my most commonly used programs without accessibility aids *most* of the time, but I still have Windows 7’s “Magnify” accessibility accessory pinned to my Task Bar, and I still use it from time to time, especially when my eyes get tired. I used it a few days ago when I was running spelling, grammar, and style-consistency checks in a LibreOffice Writer document and the checks went into the footnotes, which used a font that was just small enough to strain my eyes with Writer’s Sidebar displayed. To be honest, when I need a magnifier, it tends to be for both typing *and* reading, so I’m not sure something like BigType, which kicks in only for typing, would be suitable for me. I can imagine there are some use cases where it would be. I do it in a browser tab. Bookmark this. You can easily change the style sheet to what you want. I recommend Windows users get the free version of Clipboard Master from Jumping Bytes.